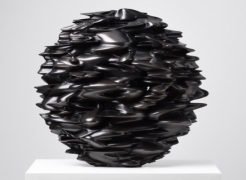 Leila Heller Gallery is pleased to present the first solo exhibition in the UAE by Tony Cragg (b. 1949), one of the world’s most distinguished contemporary sculptors. The exhibition, Sculptures, will feature 18 new works of bronze, stone, wood and glass. Cragg's sculptural œuvre was originally motivated by his encounter with English Land Art and Performance and is still distinguished by its surprising formal innovations and combinations. His horizontal extension of the biomorphic form is reminiscent of futurist Italian speed fanatics like Umberto Boccioni and Giacomo Balla, while the verticality of his pillar-like sculptures brings to mind Constantin Brancusi, who similarly arrived at a reduction of the natural form through his abstract formal language. among the simplest and earliest surviving man-made objects and thus become important markers of culture. In his latest sculptures, Tony Cragg draws on the idea of the Early Forms however, he has increased the elasticity and dynamics of the composition to such an extent that they now push the limits of the material shape. In recent years, heads and faces have become a leitmotif in Cragg’s work. A morphing circular movement shapes the rhythm of the sculptures and their overlapping, layered and convoluted nature gives rise to solid forms, while simultaneously mapping out vacant spaces. A work such as A Head, I Thought (2011) derives from Cragg’s Rational Being series that originates from a facial profile which is then twisted and distorted till it loses all sense of that which is recognizable, and, becomes abstracted into columns and new forms. One possibility while moving around the work is to consider how its human essence becomes recognizable or familiar, while also resonating with an organic form like a weathered cliff. The title of the work, A Head, I Thought, references both the interiority of thoughts and the exteriority of the physical human form. This work represents a complex outgrowth offering new ways of relating to these forms. Cragg has developed a method for casting bronze works that appear to be liquid or molten with patinas that range from chocolate brown to red and gold that explore formal compression and elongation techniques of abstraction. Luke, with its voluminous, playful, circular structure appears to be both rising up and sliding down from the center implying a sense of water flowing down the back of a rock surface. Likewise, Spring’s abstracted rays of sun depicting a sunrise take these natural subjects to extreme extrapolation. The exhibition concludes with a new body of glass works made in Murano, Venice and explores how the transparency of glass continues to engage with Cragg’s material inquiry between what is on the skin and what is beneath the surface. This exhibition gives great opportunity to witness a master sculptor working in his prime and showcases the ceaseless curiosity, experimentation and diversity within his practice. Tony Cragg was born in Liverpool, UK in 1949 and has lived in Wuppertal, Germany since 1977. He began his foundational studies at the Gloucestershire College of Art and Design and received a BA from Wimbledon School of Art, London, UK (1973) and an MA from the Royal College of Art, London, UK (1977). Since the 1980s his work has been presented at many significant international exhibitions, including documenta 7 and 8 in Kassel (1982 and 1987), São Paulo Biennial (1983) and Venice Biennale in 1980, 1988 (representing Great Britain), 1993 and 1997. In 1988 he was awarded the Turner Prize, and in 1992 he was made a Chevalier des Arts et des Lettres. From 1979 he taught at the Düsseldorf Academy of Art, where he became professor in 1988. In 2001 he was appointed Professor of Sculpture at the Berlin Academy of Arts. Since 1994 he has been a member of the Royal Academy of Arts, London, and since 2002 a member of the Academy of Arts, Berlin; that same year he was elevated to the status of Commander of the British Empire (CBE). In 2007, Tony Cragg received one of the most prestigious art prizes in the world, the Praemium Imperiale. In 2009 he succeeded Markus Lüpertz as Rector of the Düsseldorf Academy of Art. Major institutions have continuously presented Tony Cragg's works in solo exhibitions since the 1980s including Kunsthalle, Bern (1983); Lousiana Museum Humlebæk (1984); Brooklyn Museum, New York (1988); Tate Gallery, London, UK (1988); Kunstsammlung Nordrhein-Westphalen, Düsseldorf (1989); Art Institute of Chicago (1990); Stedelijk van Abbemuseum, Eindhoven, The Netherlands (1991); Reina Sofia, Madrid (1995); Von der Heydt- Museum, Wuppertal (1999); Tate Gallery, Liverpool (2000); Kunst- und Ausstellungshalle der Bundesrepublik Deutschland, Bonn (2003); Neues Museum, Nuremberg (2005); Lehmbruck Museum, Duisburg (2007); Belvedere, Vienna (exhibition with F.X. Messerschmidt in 2008); Staatlichen Kunsthalle, Karlsruhe; Museum der Moderne, Salzburg (2009); the Scottish National Gallery, Edinburgh, UK (2011); CAFA Museum in Beijing, China (2012); Heydar Aliyev Centre, Baku, Azerbaijan (2014); Benaki Museum, Athens, Greece (2015); The State Hermitage Museum, St Petersburg, Russia (2016). The artist has recently been the subject of a major career retrospective ‘Parts of the World’ in Germany, at the Von der Heydt Museum (19 April – 14 August 2016) near his studio and sculpture park in Wuppertal. Cragg will be honoured with his largest exhibition to date in the United Kingdom at Yorkshire Sculpture Park (4 March – 3 September 2017).